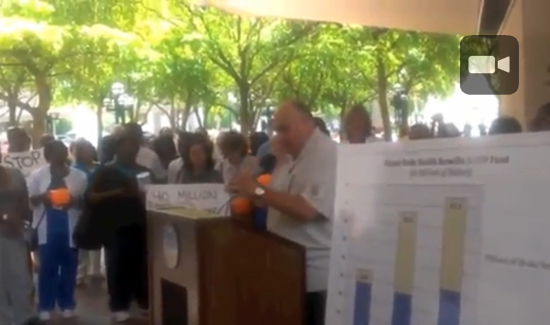 When John Rivera, president of the Dade County PBA (representing over 7000 county law enforcement officers) along with members of the Jackson Health System, the County’s Water and Sewer Division and others, discovered the county was sitting on a a multi-million dollar slush fund at the same time officials were trying to cut their pay and benefits, a rowdy rally of county workers amassed outside city hall to demand an independent audit of the county’s health fund. Watch Rivera get them going. And please leave your comments below. Do you think this is an appropriate role for the police union president? If not, why not. Leave your comments below.